I write this post today with great sadness in my heart because I had to say a final goodbye to my sweet cat Yoda. She came into my life over 16 years ago when I mentioned to a vet my readiness to adopt a cat. He said they had one that would benefit from my psychology background. They took me to the back where they had all the animals in cages. My first glimpse of Yoda was of her cowering in the back of the vet’s cage. She looked exactly like the character of Yoda on Star Wars . . . square body and huge ears. She was only about 3-months-old, had been abandoned in a field, and had been fending for herself for a few months. When they handed her to me, Yoda clung to my shoulder for dear life. My heart melted; and the rest, as they say, is history! As we all do with all of our pets, Yoda and I developed many routines. And with Yoda, you have all unknowingly felt her presence. Yoda usually kept her distance; however, years ago, I learned that she loved being with me when I was at the computer. So I moved a chair up next to mine, and she would sit/sleep there beside me most of the day. And although she usually pulled away from all touch, over the years, she learned to let me put my hand down on her while I worked. We would sit and work that way every day . . . 7 days a week. That is the picture I’ve included with this post today. 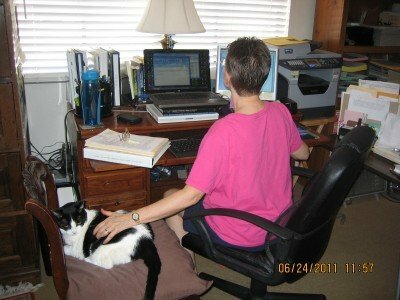 Yoda became my “Computer Buddy,” and her energy became part of my work with all of you. And as an added gift . . . I loved giving her Reiki and Karuna Reiki every day in this position; so as I flowed the healing energy to her, it also healed me. As a Psychologist, I used to specialize in grief and loss. I often have to reassure people because they report things like, “What is wrong with me!? I never cried this much over the death of my mother/father/etc.? !” Losing a pet is different than losing a person. For the most part, our pets provide us with nothing but unconditional love. They greet us at the door. They make us feel very loved and special. They catch our tears in their fur. Almost all of the interactions are positive. But human relationships are different. They can (and often do) involve both positive and negative experiences, and the negative experiences make the grieving process more complex. The grief over the loss of a pet is less complicated and therefore “pure.” Because of this, it hurts more deeply for most people. So there is nothing to worry about if you feel the pain more acutely with the loss of a pet than you did with the loss of a human companion. The intensity of the grief is normal and natural. And I just want to add that any new grief (and especially the “pure” grief that you feel when you lose a beloved pet) can bring up past, unresolved grief . . . and even grief from past lives that is stored in our cellular memory. Allow the pain, sadness, and tears to come. They often will come in waves . . . for days . . . for weeks . . . even for months or years after the actual loss. Let the waves of emotion move through you. And before long, you will notice that the time between waves grows longer. It will get easier . . . day by day. Time really does heal. I want to close this post by sharing something that was given to me by my very good friend Don Lawson. He shared it with me when I unexpectedly lost another cat many years ago. Since that time, “The Rainbow Bridge” has provided me with such comfort, and I do my best to share it with everyone I know who has lost a pet. It reminds me that our pets never die. As with our human companions, they will be waiting for us on the other side of the veil. I share this wonderful piece of writing with you now with my blessings, and a huge “Thank you” to my “Computer Buddy” Yoda for sharing the last 16 years with me. I miss you very much! Just this side of Heaven is a place called Rainbow Bridge. When an animal dies that has been especially close to someone here, that pet goes to Rainbow Bridge. There are meadows and hills for our special friends so they can run and play together. There is plenty of food, water, and sunshine, and our friends are warm and comfortable. All the animals that have been ill and/or old are restored to health and vigor; those who were hurt or maimed are made whole and strong again, just as we remember them in our dreams of days and times gone by. The animals are happy and content, except for one small thing; they each miss someone very special to them, who had to be left behind. They all run and play together, but the day comes when one suddenly stops and looks into the distance. This special friend’s eyes are intent and its eager body begins to quiver. Suddenly, this special friend begins to run from the group, flying over the green grass, its legs carrying it further and further. You have been spotted, and when you and your special friend finally meet, you cling together in joyous reunion, never to be parted again. Then happy kisses rain upon your face; your hands again caress the beloved head, and you look once more into the trusting eyes of your pet, so long gone from your life but never absent from your heart. Then you cross Rainbow Bridge together . . .